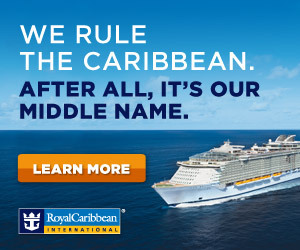 Home Cruising Royal Caribbean Did We Escape From the Future? You’re on vacation aboard Royal Caribbean Cruise Line’s Anthem of the Seas and someone locks you in a room with 9 other people and tells you that you’ve been transported to the future and have just 60 minutes to get yourself back. What do you do? 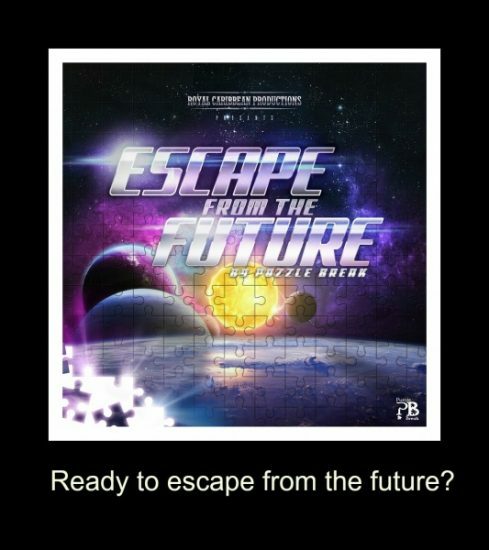 That’s the scenario that plays out aboard Anthem of the Seas new Escape from the Future room by Puzzle Break. 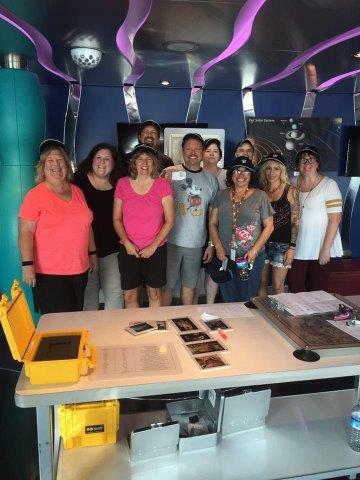 Our team of agents recently had an opportunity to try the room and see just how well we work as a team. 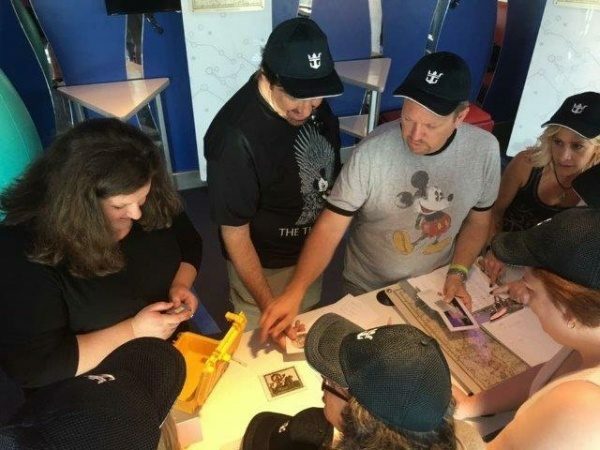 There is also an escape room aboard Royal Caribbean Cruise Line’s Harmony of the Seas ship. One of the nice features of this escape room is that you don’t need a complete compliment of players since any guest can sign up. If you have your own team, that’s great but if you don’t, you could make a few new friends as you travel back and forth through time. Escape rooms have become a very popular form of entertainment for kids, teens and adults in recent years. My own son worked at one of our local spots and so I was eager to try this experience with my colleagues. It’s located on Deck 15 in the gaming area near the bumper cars (yes, bumper cars are also available aboard this magnificent ship!). You work through a series of puzzles and clues hidden around the room trying to find the right combination of answers to unlock the final key to escape the room. There’s no harm if you don’t finish. The fun is in the journey of unless of course, success is the only option. We worked well as a team! We broke up into groups and then worked together when we needed to solve something harder. Our host stayed in the room with us and was there to provide clues if we needed them without giving us the answers to the puzzles. She told us she’d never lie to us so we knew if we got a clue or was told we were going in the wrong direction that we could trust her responses. No special knowledge is needed for these escape rooms and advance registration is required. So bring your thinking cap and your intuition and give it a go! Congratulations Magic For Less Travel Agents. You did it! We made it back from the Future! Jeannette Cona-Larock is an affiliate agent with The Magic For Less Travel. She is an experienced world traveler and knowledgeable about Disney destinations, Universal Studios and Royal Caribbean Cruise Lines. She can also help you plan trips to many other worldwide destinations. Ask her anything and she'll be happy to help in any way she can. 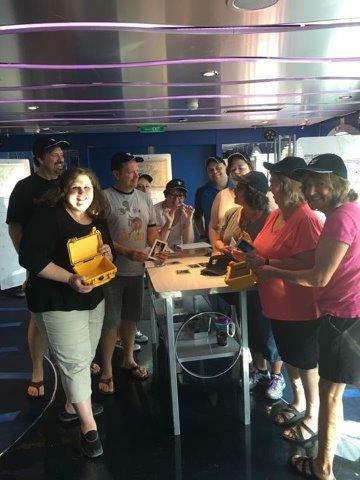 Anthem of the Seas, cruise, Escape Room, Harmony of the Seas, Royal Caribbean. Bookmark.